How much will it cost to furnish my bedroom? The bedroom. Your sanctuary, refuge from the craziness, place to rest your head and recharge. If you are anything like me, your bedroom, particularly your bed, is that final spot at the end of the day where you just get to unwind. So how much would you spend to achieve that zen moment at the end of each day? Of course there are a lot of factors that have nothing to do with furniture that can get you to that zen feeling but I know for me, when I feel like my room is put together, I feel more put together! The nice thing about furnishing your bedrooms is that a minimal bedroom can be just as beautiful as one chocked full of accessories, drapes etc. If I was to suggest one thing you splurge on it would be room darkening window treatments! No one wants to be woken up with the sun! How much will it cost to furnish my dining room? We’re still talking budgets over here and today I want to address the dining room. The dining room is one of those rooms that either gets used or it doesn’t. There’s hardly an in between. How often this room is utilized is always a big factor in how much you want to spend on the furniture. If this is a room that is sitting idly than feel free to spend very little on the space. On the other hand if this is a multipurpose room that has to stand up to kids as well as wild dinner parties, you may want to go the extra mile to ensure its longevity. I would suggest opting for all wood dining chairs if you are looking for something that is budget conscience as well as durable. While upholstered chairs are pretty, if you don’t have the budget to spring for a great durable fabric than stick with something totally wipeable and save yourself the stress. Don’t be afraid to have fun with your dining room decor. Especially if the room isn’t used too often. Get out of your comfort zone and splurge on a fun wallpaper or if that’s too risky, add a geometric fabric to otherwise traditional chairs. Whatever risk you’re willing to take, do it! How much will it cost to furnish my living room? The most important question when working with a designer always comes down to budget. The situation I run into the most is a client who needs help designing their home but has absolutely no idea how much they should invest in their furnishings. The average client doesn’t know how much a great table or super comfortable high quality chairs cost—but I do. I decided to breakdown what I think an average living room would cost as well as a more high-end room. Lots of my clients fall somewhere in the middle. It really depends on how custom and unique you want your space to be! Keep scrolling to see how much you need to save for your dream living room. Remember: These numbers are subject to change and not everyone starts with a completely blank space. You may already have a great sofa or rug and only need to invest in some of the other pieces or maybe you love vintage and have time to hunt for a good deal. This just gives you a guideline! The master bedroom on Laurel St. hits all the notes for me. It’s light, bright, soothing and relaxing. When you have a demanding job or kids running you ragged, the master bedroom is the sweet spot where you can get away from all the crazy and de-stress. Let’s dive into the design of this room head first! We knew we wanted a statement bed since the room is so large and the ceilings are so high. We opted to have a custom bed made by a local workroom here in Houston. The bed is the showstopper so we splurged on this item in the room. I love when there is enough space next to the bed for a medium sized dresser rather than a small nightstand. These oversized lamps and mirrors really draw the eye up and emphasize the shiplap ceiling. The pop of pink on the bed really ties this room into the rest of the house’s blue and pink color scheme. These pillows are from a favorite online shop called Little Design co. They have tons of ready-made pillows in designer fabrics at very affordable prices. Their bolster pillows are my absolute favorite! For the drapery, we bought ready-made white linen curtains and had my drapery workroom add the trim and blue linen fabric. In the end I’m not sure it was much more cost effective than just having the workroom make them from scratch. There was a couple of hiccups with getting the drapes to hit the floor at the proper length. Drapery can be very expensive but it all depends on the cost of fabric and size of windows. If you can fit in your budget, I would definitely say opt for custom drapes. The greek key stools are also a favorite. They originally came with a dark navy fabric on top so we had them reupholstered to fit better with our blue and pink color scheme. These small customizations are what make this room shine! Do you have a favorite part of this room? Does your master bedroom allow for peace and relaxation? Let me know if I can help! The family room is truly the heart of the home for me. It’s the spot where the whole family gathers to watch movies and play games and is so important get right when designing a home. This room was nice and large and called for my favorite furniture layout; two sofas facing each other, large coffee table and two arm chairs. Don’t forget about the little stools tucked in front of the fireplace! Slipcovered sofas with stain repellant fabric was an absolute must in this family friendly living room. We even took it a step further and went with a dark grey fabric to really camouflage any spills. I like to opt for the bench seat on the seat cushions so it really feels like a bed when lounging! We decided to go bold in the swivel chairs and chose a paisley print fabric. Always opt for a swivel chair if there is a room adjacent that has a lot of action going on. That way your guests can feel apart of both rooms and never even leave their seat! A simple Seagrass rug compliments the grey and white furniture and the white farmhouse coffee table is virtually indestructible. Perfect for a family with young children. This bright family room is chock full of natural elements. From the bright colored moss balls on the coffee table to the faux hydrangeas on the bookshelves. Even the pillows have a nod to the outdoors with the floral print fabric. What did you love most about this room? What would you say your style is? Is it reflected in your home? Let me know in the comments below! Lots of steps need to be taken when designing a space in your home where the primary function is eating! For the breakfast room, I knew I had to made it super kid friendly so this family didn’t have to worry about one spill! My client wanted the overall house to be a more transitional design but she loves farmhouse décor at heart, so we added some country nods in her breakfast room. We started with a cowhide rug, which frames the space out without boxing it in. Use a cowhide rug when you don’t have a super defined furniture area, like a sitting area or under a round table. It’s organic enough that it doesn’t become too boxy but still sets the foundation for that area. Cowhide rugs are perfect under a dining table because the spills just wipe right off. They are super easy to maintain with a vacuum and a wet sponge or cloth. We had the custom round trestle table made to fit this space perfectly. We chose a darker stain and made sure it was super sealed so there would be no worry for grease stains or glass rings! We added the large farmhouse light fixture from Restoration Hardware to create some big impact. It comes in several different sizes and finishes. I often see lighting that is too small for the space so I think you’re better off going a tad bit bigger than smaller. The rattan breakfast chairs are my favorite part of this room! I love that the frame of the chair is completely wipe-able and that the cushion is covered in an indoor outdoor fabric. These chairs originally came with a dinky white cushion so I hade my drapery workroom make new ones in a kid friendly fabric. You absolutely need a cushion for comfort but we knew that white fabric would not last one minute with a 2 year old and a 9 month old! Most of the time you can find a high chair strapped to one of these seats. These cushions have zippers so if worse come to worst you can take them off and wash them! A tip for washing slip covers: wash them in a gentle cycle and let them air dry. When they are still damp, slip them back on the cushion and let them finish drying. This removes wrinkles and ensures that you won’t shrink your cover! The dark wood table can sometimes feel heavy but these dining chairs are so light and airy, it compliments the table perfectly. Right next to the breakfast area is a small peninsula leading to the kitchen. I love how the black Windsor counter stool plays off of the black in the light fixture. There are tons of companies that make these Windsor chairs in all different price points. I chose these from Target for around $85 each and they are super sturdy and come in a variety of colors! The key to any room is to mix budget items with higher end more customized items. Extra points if you have great vintage or antique pieces and are looking to incorporate them into a more streamlined aesthetic! This client wanted to elevate her style by choosing more transitional home decor items but stuck with her roots in the breakfast room where they could all be decidedly more casual! Continuing our ‘Design Decoded’ series of the Laurel Street project with this gorgeous room! I have to say that this was my favorite room of the Laurel House project. This room functions as an office for the husband so it was a nice break from the pinks and florals used in the rest of the house, though the husband really likes those too! My own home leans more masculine so this room is right up my alley. This room started off with just the built ins painted in this great blue paint color. I decided we should paint the rest of the room the same color as the built ins. I took one of the shelves to Sherwin Williams and had them color match the existing paint. They now have the formula saved in their system so if I ever want to use it again I can refer back to them! A large black statement desk grounds the room and is the perfect spot to open up a laptop and close a few deals. Across from the desk sits two wingback chairs. I liked that these wingbacks were a more modern and updated take on the traditional wingback chair. My clients hunting trophies are on full display in this study! They are both avid hunters so this was a great spot to showcase their hobby. We definitely saved money on art in this room since everything on the walls was some sort of memento from hunting or baseball. I love incorporating meaningful items into a home whether it’s on the bookshelves or the wall. Next up was to fill in those bookcases! We didn’t have to do too much shopping in this category since he had so many great items to work with. He had tons of old photos, family heirlooms and sports memorabilia so we started by displaying everything of importance and filled in with smaller decorative items like small succulents, books and picture frames. We went with a simple seagrass rug from Pottery Barn but layered one of his hides on top. We also added a custom roman shade in a plaid linen fabric. I chose light filtering backing so that we could keep this room bright but maintain privacy. When ordering custom window treatments, you always have the option of what type of liner you want to use. I always choose black out lining for bedrooms but opt for light filtering in the main living spaces. What did you love most about this room? Do you think that your husband would love this masculine office? I’d love to hear your thoughts in the comments! Next up for our Laurel Street Project is the dining room. This dining room was a huge blank canvas. I knew my client wanted to be able to fit a large amount of people in here so we opted for just a large dining table a rug and chairs. They also have a butlers pantry right off the dining room that has tons of extra storage so we knew we didn’t want to take up space in the dining room with any sort of china cabinet or credenza. There was a lot of wall space to cover and I knew wallpaper would make a huge impact without cluttering all the walls with art. We opted for this traditional damask/paisley print in an updated silver-gray color pallet. I love how the four large mirrors take up the large wall and reflect the formal living room. We had a custom diamond seagrass rug cut for this room that is perfect for this transitional dining room. Seagrass rugs are super durable and are really easy to clean when it comes to all the little spills around the table. There are plenty of places online where you can find standard sizes for these rugs i.e. Pottery Barn, Overstock etc. but if you room doesn’t call for a standard rug, getting one cut to your room is a great option. We had the table custom made so we could control the finish and the dimensions. I learned that some places like Restoration Hardware don’t seal their tables so that is an extra cost and hassle that I didn’t want to deal with. This table has a nice smooth finish that repels rings and stains. I love how we customized these dining chairs! We ordered the chairs in the standard manufacturers fabric but chose a new fabric to reupholster the backs with. This let’s you have a custom chair that no one else has for the fraction of the cost of a completely custom chair. I chose a fabric that had the same tones as the wallpaper but in a more graphic and modern style. I didn’t want this room to feel too traditional since my client wanted to keep a more transitional feel. Despite all the silver and grey in here, we went with 2 large gilded lanterns to hang over the dining table. These gorgeous lanterns pop right off the wall. If they were silver they would disappear into all of that wallpaper. This is a perfect example of how to successfully mix metals! The last detail of this dining room is the soft bench cushion that sits near the bay window. This allows one more spot for extra seating so we kept it simple so it wouldn’t compete with the wallpaper. I know there have been many adult dinners with little children perched near by! What was your favorite detail about this project? And would you want to wallpaper your dining room? Let us know in the comments! The interior design process always seems like a mystery some so I’m happy to drop the veil a little and show you what it’s like to work with Lacey Michalek Interiors! So, without further ado, I’m starting with the living room I completed last year on Laurel Street. This couple was going from a much smaller 3 bedroom home where all the furniture was left behind to Hurricane Harvey flood victims. We had a completely blank slate to work with. It’s safe to say this family sat on fold out chairs for a hot minute before all of their furniture came in! This is the first room to the left when you walk into the house. They had a separate family room where everyone can get cozy and watch TV so we knew we wanted this to be a more formal area for them to chat with friends and have drinks. It all started with the tufted sofa. We knew wanted it to take center stage but we couldn’t tell online if it was more blue or more gray. IN this instance she just wanted to go for it and sort of plan the room around it so that’s exactly what we did. It definitely came in more gray than what was shown online but we were thrilled with it and pressed on! Next up we relied on Miss Joana Gaines and her rug line for Loloi for the rug. It’s an updated traditional rug with beautiful gray and blue muted tones. Fun Fact: Did you know some rugs have a dark and a light side? Depending on the way this rug was laid you could choose to see all the details in the rug or have it appear more muted and see mostly the sheen. Wallpaper was up next! I chose a soft grey grasscloth to give some warmth and texture to this room. It makes the room feel so cozy! We got these great botanical prints from a local retail store, Magpies Gifts. The frames were originally black with a little gold and we used a little rub and buff to make them fully gold. I thought it would play better with the gilded lamp and coffee table. I really wanted this room to be a little jewel box so every touch was thought out, no matter how small. We searched and searched for some great pink chairs but kept coming up short. We finally decided to recover some existing chairs instead! These chairs are covered in a Crypton fabric which is super stain resistant and bleach cleanable. The Ikat printed stools that we had custom made through Ballard have to be my favorite element in the room. The fabric was a frontrunner for pillows at the beginning of the project but it never made the cut. We were saving it for something special and I’m so happy we found a way to incorporate it into this room. 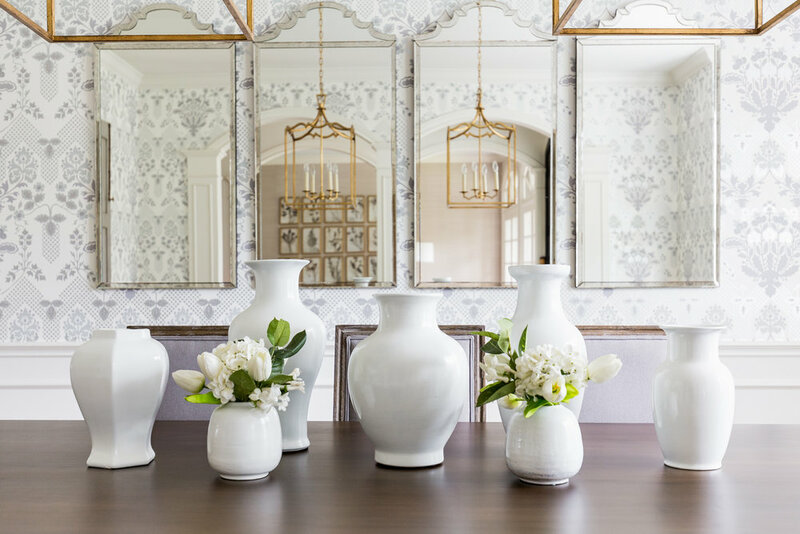 My client already had this beautiful mirrored cabinet so all we needed to do was add a gold round mirror and white gourd lamps to play off the white ceramic stools we used as side tables. I would say the style of this house is transitional but we went a little more on the modern side with the abstract art we placed opposite the botanicals. The bar cart is the perfect spot for their guests to mix their cocktail before sitting down for a chat! I love how feminine this room is! With that being said, would you believe me if I told you this is the husband’s favorite room in the house? He definitely wasn’t afraid of a little pink! What do you love most about this project? And do you think your spouse would be afraid of incorporating pink into a room? I’d love to hear your thoughts! Want to take a peak into my interior designer brain? Follow along to find out my top 5 secrets a learned on the job!